Hopi food sustainability and orchard-garden program support. May, 2015 orchard planting with Natwanhoym Tunatya. Orchard, garden and healthy eating projects in support of Hopi food sustainability. Orchards, edible shrubs, herbs, kitchen garden projects using low water drip systems and permaculture design-with-nature practices (such as mulching, companion planting, contouring, rain cisterns) as part of creating more local food supply and healthier diet for Hopi food sustainability. There is growing interest at Hopi in this type of food raising along with the traditional dry-farm crops that Hopi farmers have cultivated for centuries. We are support Hopi initiated projects led by knowledgeable Hopi and regional gardeners. The goal is for each project to become a viable food-producing installation and a learning opportunity for other Hopis while increasing Hopi food sustainability. Orchard in 7th year Kykotsmovi with companion plantings (guilds and wind break trees) and heavy mulching thrive with very little watering. Photo by Sandra Cosentino 2018. Solar Greenhouse part of new natural home by Hopi Tutskwa Permaculture. This dedicated group is doing very effective work in training Hopis in permaculture style farming with drip systems, mulching and companion planting, greenhouses. They are leading workshops to plant orchards in schools and individual Hopi farms, created the Hopi Food Co-0p group, and are building energy efficient natural homes and training Hopis builders. 2017 Straw bale natural home with start of food growing terraces by Hopi Tutskwa Permaculture. Garlic harvest by Hopi Tutskwa Permaculture. “Communities practice cooperation in all aspects of life, continuing the traditional Hopi values of Sumi’nangwa and Nami’nagwa which means to help others selflessly for the good of everyone. Communities learn to value, care for, respect, protect, and manage the natural environment while ensuring adequate resources for the future generations. Communities will learn innovative ways towards creating sustainable communities locally and regionally. Communities have clean water, good nutritious food, and thriving ecosystems and watersheds. Quotes above from Hopi Tutskwa Permaculture website. $2000 to be administered by HTP to 3 of their worthy trainees to provide support for drips system installation and mulch hauling to support their new permaculture orchards and gardens. Sedona orchardist Mario Valeruz and I will be meeting these farmers and seeing their sites this fall. We will continue supporting Mario’s field visits to consult with Hopi groups on orchard restoration. In 2018 we donated $7,000 (including a specific $2,000 grant to them from a supportive donor!) to deepen support for this effective and dedicated group. Since 2014 we have been providing support for a Hopi youth group at Second Mesa which is called Natwanhoyum Tunatya (means teach and farm together for the future). Spring 2015 we provided plants, supplies, tractor repair, and an instructor for the the installation of their drip-system supported orchard-vines-herbs garden adjacent to the dry farm area of their coordinators. 2016 and 2017, we continued support with additional plants, mulch hauling, camping and learning supplies, and continued permaculture workshops with Sedona orchardist Mario Valeruz. Natwanhoyum Tunatya (means teach and farm together for the future) at Second Mesa, Hopi. 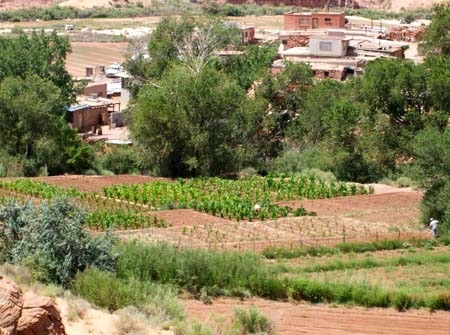 Farming at Hopi is a whole set of values and spiritual practices. information about the group provided by Natwanhoyum coordinators: “Natwanhoym Tunatya was founded in 2012 by two Hopi farmers and 28 Youth Farmers, the purpose of this Hopi-based service group is to develop a farming relationship with the Shungopavi youth between 6 – 18 years of age. Namitnagwa – to teach and practice the principal of farming together Samitnagwa – to teach the growth process of natwani (means produce and refers to the processes and rituals necessary for the rejuvenation of all life) and its values. Providing natwani to their family table, ceremonies and social events. To practice organic gardening–both with Hopi traditional dry farming and using drip irrigation–and promote healthy eating habits. Philosophy of the Coordinators: Promote good guardianship and stewardship of the Natwanhoyum Resources today and tomorrow to benefit the current and future generations. Vision To stay connected to Mother Earth while we pray to Dawa, our father. Through our prayers we ask to be blessed with rain so that our crop fields and grasslands have sufficient water for food production for healthful life. The Hopi youth farming group needs notebooks and pencils for Hopi language learning; art supplies to help teach them art as part of their livelihood (acrylic paints, paper, art boards, exacto knives and sandpaper for carving and making gourd rattles).